Every pond should have an intimate seating area alongside with the possible addition of entertainment area with outdoor barbeque and alfresco dining. 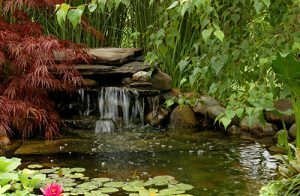 The design professionals at IVY Studio, an outdoor expansion design and build firm based in Massachusetts have experience in designing and building a living pond as part of your outdoor expansion project. We work with you in designing the ideal pond in concert with hardscape and plantings complimenting the overall aesthetic feel and use. Water lilies, hosta, Boston ivy are a few of the low maintenance plantings of choice. Once established and up and running, ponds tend to be the garden gift that keeps on giving and are a unique habitat for all kinds of creatures that you can enjoy in all seasons. The addition of large boulders and Shasta daisies spilling over the boulders will add to the natural look and create the impression that they have been there for years. Contact us at 781-591-0300 or vern@ivystudioMA.com to have us plan, design and install a pond in your landscape and in the process enhance your use and enjoyment of the outdoor spaces in your home.